Discussion Forums › Rogue Politics › Election 2016 ! Today during early voting in Texas an interesting situation showed up. An named individual went to vote and care to guess the next part? He hit ALL republican button..
Then before he verified he read the vote and discovered something.. He was about to vote for HRC..
Well.. Of course he fixed it but this leaves us with a very interesting problem.. They talked with friends in different states.. Same thing for Florida, Arizona and California..
Now.. I have no evidence of this but, just wow.. So just remember to check your ballot completely before you hit the final confirmation.. If it happens to you.. File complaints.. It's Not going to Stop, the Liberal Progressive Can't Win without Cheating and Lying! They also want and allowing their Illegals To Vote! Quote: A comparison of records by David Goldstein, investigative reporter for CBS2/KCAL9, has revealed hundreds of so-called dead voters in Southern California, a vast majority of them in Los Angeles County. “He took a lot of time choosing his candidates,” said Annette Givans of her father, John Cenkner. Cenkner died in Palmdale in 2003. Despite this, records show that he somehow voted from the grave in 2004, 2005, 2006, 2008 and 2010. But he’s not the only one. 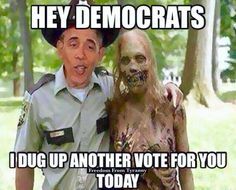 CBS2 compared millions of voting records from the California Secretary of State’s office with death records from the Social Security Administration and found hundreds of so-called dead voters. Specifically, 265 in Southern California and a vast majority of them, 215, in Los Angeles County alone. The numbers come from state records that show votes were cast in that person’s name after they died. In some cases, Goldstein discovered that they voted year after year. Of-Course California is not the only State. These spirits are loyal americans to the point They have voted from the grave..
And you say you dont believe in ghost.. The word 'rigged' just doesn't somehow seem to cover it! It's a sad day for people's perceptions of the west. Quote: America’s limited experiment with voter-ID laws may come to an end after this election. Democrats keep claiming that voter fraud is a myth. But voter fraud has mattered in plenty of American elections. Take Lyndon Johnson’s election to the U.S. Senate in 1948, when LBJ won by manufacturing enough fake votes to turn a 20,000-vote deficit into an 87-vote win. Others point to voter fraud in Illinois and Texas during the 1960 presidential election; indeed, we may never know whether Kennedy actually “won.” Chicago was infamous for counting the votes of dead people. In 1982, U.S. Attorney Daniel Webb found that at least 100,000 fraudulent votes were cast. In 1994, Democrats obtained control of the Pennsylvania state Senate through large-scale voter fraud using absentee ballots. In 2008, illegal voting made a decisive difference in a U.S. Senate race, giving Al Franken a seat from Minnesota — one could argue that Franken’s vote allowed Obamacare to get through the Senate. Eighty-three absentee ballots were sent to different registered voters who all supposedly lived in the same small, two-bedroom apartment. FieldWorks LLC, a Democratic organization, was raided by Pennsylvania State Police for fraudulently filling out registration forms for thousands of voters. An investigation by CBS Channel 2 found people who had been registered to vote after their death — a total of 119 dead people who had voted 229 times. In an examination of just eight out of the Commonwealth’s 133 counties and independent cities, 1,046 illegal aliens were discovered to have illegally registered to vote. In an undercover video, even Democrats were recently caught complaining about the amount of voter fraud created by New York City mayor Bill de Blasio’s decision to give out ID cards without checking recipients’ identities. Many of these problems would have been avoided if voters had to register in-person using a valid photo ID. This simple, commonsense requirement is standard in about a hundred countries around the world. Moreover, many countries’ voter requirements are more stringent than anything even being discussed in the United States. Mexican voters must present voter IDs, which include not only a photo but also a thumbprint to help ensure people don’t register more than once. The IDs carry holographic images, embedded security codes, and a magnetic strip with still more security information. As an extra precaution, multiple-voting is further prevented by dipping voters’ fingers in indelible ink. Many countries’ voter requirements are more stringent than anything even being discussed in the United States. Mexican voters cannot register by mail — instead, they must go to their registration office and fill out forms for their voter ID. When the voter card is ready three months later, the voter must make a second trip to pick it up from the registration office. Absentee ballots must be requested at least six months before the election. And yet somehow people in Mexico are still able to vote despite these restrictive rules. In fact, the voter-participation rate actually went up after the 1991 reforms. The new rules gave people confidence that their votes actually mattered. Supposedly, though, a photo ID is too much to ask of American citizens. There is evidence that, even in the U.S., voter-ID laws are associated with increased voting rates. And there hasn’t been any evidence that voting regulations disproportionately harm minorities, the poor, or the elderly. 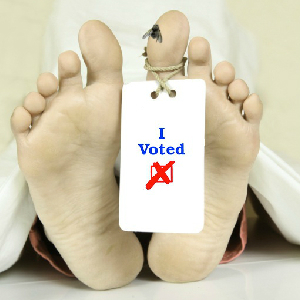 Unfortunately, the fate of Americas recent, limited experiment with voter-ID laws will be determined by this election. After Supreme Court justice Antonin Scalia’s death earlier this year, Democratic-appointee-dominated district and appeals courts around the country have had free reign in striking down voter-ID laws. Their rulings will be upheld if Hillary Clinton wins and gets to appoint Scalia’s replacement, which will result in a 5-to-4 liberal majority on the Supreme Court. There is a real cost to voter fraud. The rigging of elections undermines the government’s legitimacy and discourages lawful voting. Today’s election will determine whether states have any chance of solving this problem. — John R. Lott Jr. is the president of the Crime Prevention Research Center and the author of The War on Guns. Bumping this thread to add this video showing the PROOF that the 2018 general elections were fraudulent. Project Veritas goes out with their cameras once again to bring the truth to the American people. This is only the first video of more to come, so go subscribe to his channel on You Tube to see the upcoming revelations of how voter fraud is being committed in our country. The guy has a point, but that's just not how it works at the voting booth Sir.